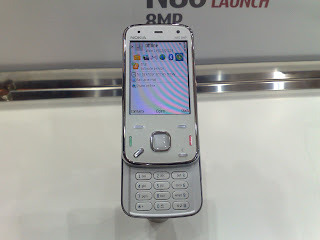 Nokia 's N86 8MP is Nokia’s first phone featuring 8-megapixel camera, 28mm wide-angle Carl Zeiss Tessar optics with mechanical shutter and variable aperture. It also has 8 GB of internal memory, Wi-Fi, GPS, QVGA OLED display, FM Transmitter and microSDHC memory slot. I took some pictures with it and i must admit the picture quality is awesome and the design is pretty slick too. Check out the video below. Here is another video with interviews of the key people behind the creation of the new 8 megapixel Nokia N86.